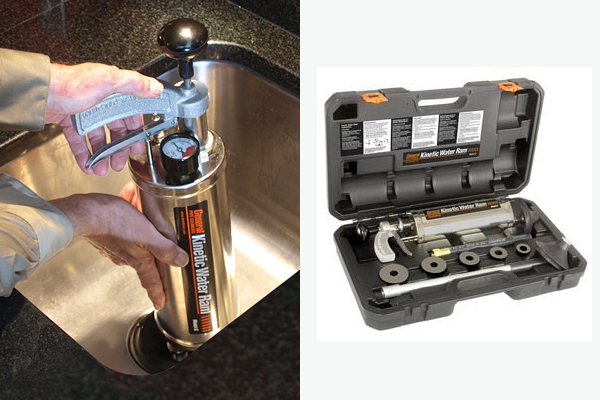 Here's a compact, light-weight tool for quickly opening clogged sinks, toilets and tubs. It handles rust, grease, sediment, and scale in lines up through 4" in diameter. The Ram has a self-contained pump and pressure gauge, so you can hit the stoppage with just the right amount of force. You get instant impact with no build-up of pressure in the plumbing system. The force is transmitted through water, so it's not affected by stacks or vents. An optional toilet attachment (KR-CA) screws onto the front of the Ram and enables you to position the cone in the bowl to get a tighter seal. As a result, you can strike the blockage with greater impact without causing splash back. Standard fittings include caulking hose, 4" tapered rubber cone and five tapered rubber plugs for sealing openings from 1-1/4" through 4"
KR-A -Base Unit: Caulking Hose, 4" Rubber Cone, 5 Rubber Plugs - 11 lbs. KR-A-WC - Base Unit + Case - 20lbs. KR-C-WC - Basic Unit + KR-CA Toilet Attachment + Case - 21 lbs. KR-D-WC - Same as KR-C-WC , less Caulking Hose, + 6" Rubber Cone, 4 Expansion Plugs, Check Valve, Extension Hose, Water Supply Hose, Faucet Adapter, Case - 27lbs.